Info: Two BR, Two+ BA, resort home w/ more than 1300 sq. ft.
Life’s always a Beach at Pensacola Beach, where the weather is warm and body surfing & beach-combing are common pastimes. Away from the sands, there are numerous sights for the entire family, including the National Aviation Museum, which features 150 vintage aircraft, flight simulators and an IMAX Theatre and Fort Pickens, a historic military fort built in 1829, and the Pensacola Lighthouse, the oldest lighthouse on the Gulf Coast and also the tallest, standing 151 feet tall on a 40 foot bluff. 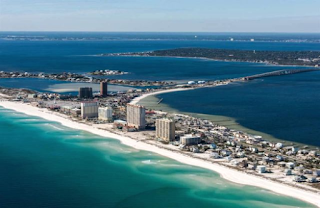 When buying or selling real estate in Pensacola Beach Florida, always have an unbiased Pensacola home inspection completed on the property by an experienced home inspector to determine the physical condition of the property, so you have a clear understanding when negotiating the contract - the inspection should be completed honestly and objectively, apart from anyone's interests other than the client.